During my last holiday I really wanted to be low maintenance so I decide to go and do a Shellac nail polish manicure beforehand. I had heard so many ads about this polish that I decided to give it a go. 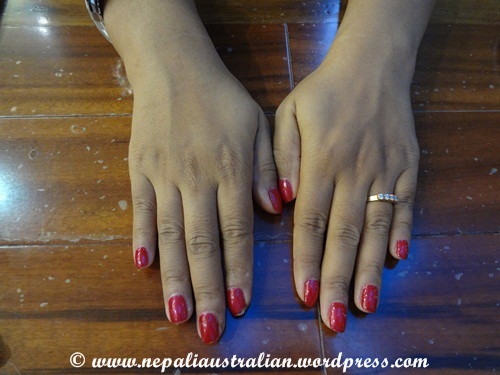 Shellac is the brain child of a California company called Creative Nail Design, more commonly known as CND. The company says it spent five years perfecting the product. 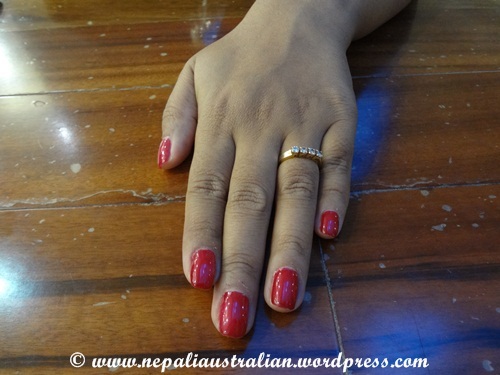 Shellac is frequently described as a hybrid of the popular gel manicure. According to the ads, the new polish is smudge-proof and lasts for weeks without chipping. That is what I was hoping for when I got it done. It was actually quick. They just removed my old nail polish, did some trimming and added just a thin coat of polish on my nail. Then they let it dry for 10 seconds and put another coat on with two minutes between the two coats of colour and the top coat. Then I went on my holiday. But to my disappointment, my Shellac experience was not as I was promised. My nail polish chipped on the very next day after I got it done. I was really annoyed but thought if I am careful, then it might last longer, as promised. 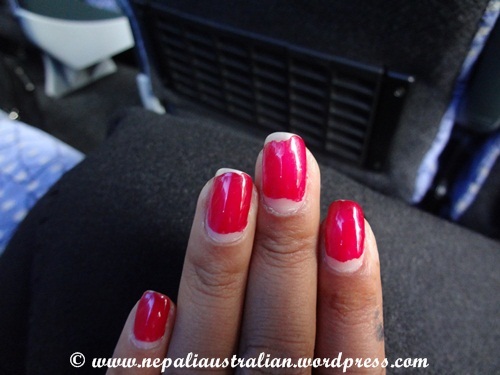 To my disappointment, this is what may nails looked like after 4 days. My verdict: Not going to pay more for this as my normal manicure lasts longer than this. When I went to the company website, CND (Creative Nail Design) says any problems with chipping, peeling, or nail damage are typically caused by someone who is not licensed, not properly trained or not following the manufacturer’s specific instructions for application and removal. You may also encounter people who claim they’re providing a Shellac manicure, but are using a different, “similar” product. I am not sure what my salon was using, but they are usually fine with their other services so I don’t know what happened with this product. This entry was posted in Fashion and tagged creative nail design. Bookmark the permalink. You know, I actually didn’t have a good experience either! Mine stayed on, but, when I took ’em off, they took the top layer of my nail with them! It took a long time to regain the strength in my nails (I’m used to have healthy, long, natural nails). I heard about that too. I think mine was not so bad to take off which makes me suspect if they were not using the real product. It just peeled off without damaging the nail like the sticker. Either way I think they are not as good as they claim to be. That’s strange that it chipped…a co-worker of mine had shellac put on about a week and a half ago, and they still look great (although the nail has grown in at the base). Maybe you could try it again at another salon? you might be able to find review online (maybe on yelp.com) to figure out which salons do it the best. I will need to find more about it. I am going away again soon so I will love to do it properly and hope it will last at least 2 weeks so I don’t have to worry about my nails during the holiday. Thanks I will check..
Hmm, I had heard so many good things about it. Guess I’m not gonna try it out then.